Social media outlets like Twitter are great ways for event production professionals to discuss hot topics and see what’s happening in the industry. In an instant – just 280 characters – so much can be said, which makes it the perfect way to keep up with the most important trends in event production. For the month January, we have procured a list of our favorite event industry profiles and influencers that you should most definitely follow on Twitter this month. Now here’s a fantastic company to follow. 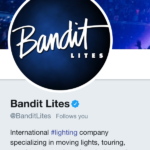 Bandit Lights is an international lighting company and they have a very active social media presence, including over 12.4k groupies, I mean followers, on Twitter. What we like about following them is getting easy access to their blog posts, which contain a wealth of industry best practices, expertise, and insight. We also love the positive tone surrounding everything they do – from their #FridayFeelings and #MotivationMonday hashtags, to their words of encouragement to “Appreciate the little things” in this industry, you will always feel a little bit better after seeing one of their posts. Believe us, you won’t regret following these guys & gals. Head to their profile and you’ll see what we mean. 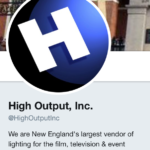 They’re New England’s largest vendor of lighting for the film, television & event industry. High Output was founded in 1986 and prides themselves on their modern technology and superior customer service. Their Twitter account is filled with images of events they’ve produced, along with some great industry insight. They recently announced their first Tech Talk Tuesday, which will be held on 1/30/2018 – and it promises free lunch for attendees! For more information check it out here: Tech Talk Tuesday’s Dynamic Lighting with a Panel of Light! We are honored to have High Output as one of our valued clients. Check out their customer success story to find out how LASSO helped them streamline their crewing process using our software. 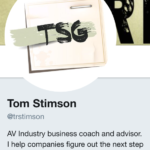 If your AV business is ever in the need for some advice, then head over to Tom Stimson’s Twitter page. Tom is an AV industry business coach and spends his time helping companies figure out the next step towards improving business results. It’s about time that you “Love your business again,” according to Tom Stimson! What we like about following Tom on Twitter is being able to quickly see when he is hosting another webinar and easily accessing the great content from his AV Matters newsletter. His posts are straightforward and easy to relate to. He recently said – “Failure is not an indication that you are growing too fast. It is a sign that you are learning too slowly.” And, we couldn’t agree more. Head over to @trstimson to see what all of the buzz is about. AV Chicago services event marketing professionals, event planners, producers and venues with their full-service production solution. And they have been doing this for over 30 years… so they certainly know what they are talking about! If you follow them on Twitter, on top of some fun #TBTs and 80s throwbacks, you’ll find phenomenal examples of their work. We hope you enjoy their wit and sense of event production humor as much as we do. Here at Lasso, we couldn’t be more proud to be a part of their success. 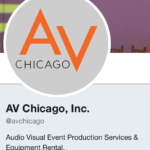 We have the pleasure of helping AV Chicago manage their workforce, vet their crew, and communicate important job details. 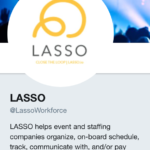 Check out how they were able to use LASSO to crew for the 7th largest event in human history – the 2016 World Series celebratory rally in Chicago! We can’t let this list go by without mentioning our own Twitter page! What you will love by following us is gaining access to the latest news, content, and industry stats. From our annual Crew Pay Rate report to industry infographics, such as our 2018 Event Production Predictions infographic, and more, you’ll walk away more knowledgeable and informed by following us on Twitter. And, we hope you’ll be able to use the insight gathered in our surveys and reports in your own event production and crewing processes. Follow us on Twitter and if you like what you see, visit www.lasso.io to request a live demo of our platform. See you there!